There's room for the television. There's room for books. There's room for movies and music and lots more. The Amish Teton Smaller Wall Unit comes ready to go rustic in your living room or family room, equipped with all the solid wood storage and display space you need. The Teton features ultra popular barn doors that you can close to conceal your TV when it's not in use. 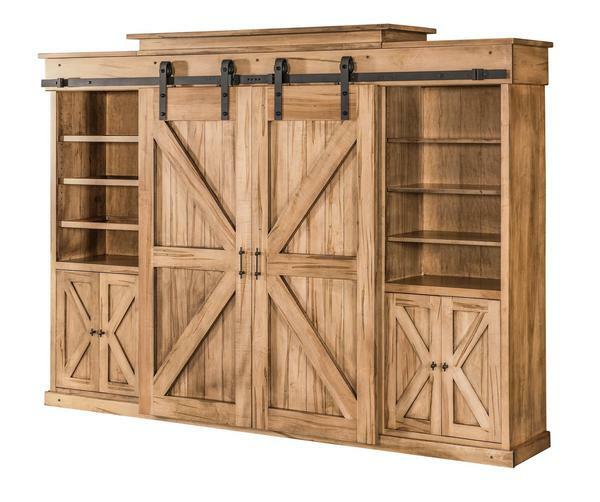 Behind the barn doors there's more delightful storage with lots of shelf and drawer space.The Teton is shown here in wormy maple wood with natural finish and graphite glaze. Set up the living room you're wishing for with a solid wood entertainment center you and your family can enjoy for generations. Contact us today with any questions. Thank you for shopping DutchCrafters.